There are so many articles circulating on how to “survive” the holidays. Let’s be honest–people survive things like hurricanes, plagues, and 5 o’clock traffic (and if family time during the holidays is that bad, you should probably schedule with us now)! Time goes so fast, life passes by so quickly, I think we all want to enjoy every sweet moment and memory that will be shared together. So how do we do that? 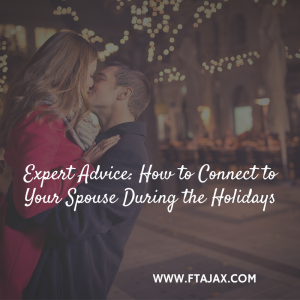 Here are four pieces of advice for couples to stay connected and fully enjoy the holiday season. 1. Keep date night alive and well – In the hustle and bustle of trying to get from one event to another, with work, shopping, a little sleep, and the never ending piles of laundry, there just doesn’t seem like time for “US.” So, put a date night on the calendar early and made it sacred! Make the commitment to continue to nurture your relationship, especially during the holidays when you are over-scheduled. 2. Make a budget and stick to it – Many people over spend during the holidays, and it causes significant stress when the credit card bills start arriving. Sit down together and decide how much you are both willing and able to spend on gifts. Write down all the people you want to buy gifts for, and how much you’d like to spend on them . Then add it up. Does that fit in the overall budget? If not, start shaving it down until it does. Then, keep the list of names and budget with you on your smart phone when you’re out shopping. 3. Create new traditions- Some of the best memories in life, and particularly around the holidays, are made with family traditions. Whether it’s baking cookies or decorating a tree together, attending a church or synagogue service as a family, having movie & pjs night before Christmas, or a family vacation at the new Year, creating or maintaining traditions help create fantastic memories. And best of all, they can cost little to no money. 4. Don’t sweat the small stuff – Personally, I am a habitual worrier. It has been a goal of mine to not sweat the small stuff. So, I focus on what is most important: loving my husband, taking care of myself, and making beautiful memories in small moments of joy. If a gift isn’t wrapped, they make gift bags; if a dish isn’t washed, there’s a dishwasher or it’ll be there in the morning; if I didn’t take the time to home make something for family dinner, (gasp) there’s Winn-Dixie deli and a beautiful platter to put it in! I encourage you to also work on not sweating the small stuff. Take the time to really cherish the moments you have with the ones you love this holiday season. If you find that the stress of this season is too overwhelming or, if it seems to highlight an existing issue within your relationship, reach out to us for some guidance to get you in a better place. Check out our other articles, Proactive Tips for a Stress-Free Holiday Season, and Five Affordable and Thoughtful Gifts Everyone Will Love.